[Challenge!] 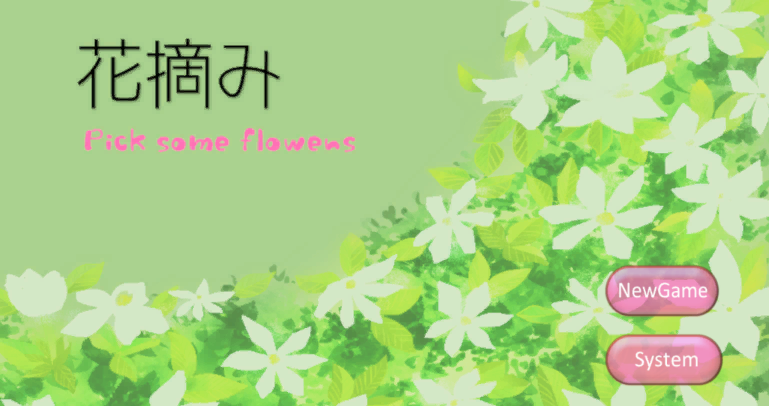 - Pick Some Flowers is another premium Japanese escape game developed by Rinnogogo. In this game, you are trying to get through the door to meet your friends. This is a beautiful escape game with lots of clever puzzles. Good luck and have fun! my have clue but I don't know where to use it. green leaf with number : going right. Combine roman numerals with the branch on the floor = red leaf. Do the math = scene1 is unlocked. Nice :). Stuck on last scene with 4 digit and roman numeral. Any clue? yes, I found that out as well, EscPaper: position of things is important. In scene1: go right, left spot = glasses in the grass and buttons on the tree. going left = green elf. Put on glasses to see order how to click the buttons. Again : watch how the leafs are attached. Inside house of the elf now. Four digits need to see where the flowers grew and see how many leaves are left. Where 1 leaf - it is necessary to count the 8th letter. There is not a 4-digit code, but a word. book and box on the shelf. I tried to translate the shapes with the help of the book, but am stuck with the D ? arrie NL, look at the BOOK. Thanks Nafanya, but, what about W=V???????? Zoran, it is more simp lethan you think. If ww=v then n=r, ll=l. should the letters found in the book be used to open the box to get the sd? arrie NL, you should have already found the sd. You need it to open the cover and enter the pass. To get a screwdriver, you need to look at the leaves above the sofa. Click on the box under the bed. Then how do you open the cover of the box? the leafs above the sofa hint to open the box from under the bed : ʇɟǝl ǝlppıɯ 'ʇɥƃıɹ uʍop 'ʇɟǝl dn = sd. use sd on the box on the shelf, enter the found word in the book = green key. key on the lock at the plant = bottle of water. outside, the spot with the shapes, click up and water the plant. Go back inside, find the elf again for her approval and take the flowers. Inuit wants three walnuts, haahha, take a good look at him !! = gold key. so confused! after doing leaf puzzle in stone hallway i can go to a scene 1 which is outside where find glasses and lots of clues but cant figure out how to use them. is anyone else outside? brin3m, read arrie NL's comments. By far he is writing smth like a WT. "Put on glasses to see order how to click the buttons. Again : watch how the leafs are attached." brin3m the order is upR, downR, downL,upR and upL. Observe numbers on their shapes and the words. click arrow, clean the mirror, fill in the word = climb down the ladder. click arrow, match and candle in drawers. light the candles = colours and numbers. Zoom out : take the plant from the table. Picture on the wall ... take the letters to get a word. Word goes in cupboard, below the drawers = soil. ǝpısʇno xoq ǝɥʇ uı lıos ǝɥʇ ʇnd .. and put in the plant. Although no flowers are blooming, a third scene is unlocked. It's a different old fashioned good game, lol, we have problems with that !! the box has 4 buttons. The arrow shows that you start with the fruit down left and go round. The leaf on the fruit down left is placed on the top of its branch and pointing right. So, the first button to click is top right. The second leaf is placed at the bottom of the small branch, also pointing right, so down right. I'm having fun, and I'm glad Antonia and Nafanya are around to help me through where needed! That third scene that is unlocked btw is scene4. spot in the grass = scissors. fill the bucket with water, water the plant in scene2. zoom out and in, take the snowdrops. don't look at where the leaves point. Look at how they are attached to the braches. Thanks antonia, that works i still don't see what you see but i believe you! brin ... the leafs are attached to their branch. either high, meaning one of the top buttons, or low, meaning one of the bottom buttons. pointing right or left shows if it's a button on the left or on the right. red key on red door = go inside. ducks : shapes and pointing left/right. facing the door, there's an arrow hidden on the left. use ducky-hint on the wooden box = half an aquarium is revealed. take the table, note the line that's drawn in the box, it shows 6 corners. Place the table in the doorscene on the right, climb up. Ohhh, hmmm … first click scissors, cut loose the spoon to get the key out of the aquarium. Key unlocks the tub with fower growth agent. Fill the glass with it. Outside, click the corners on the box below the plant. Use the growing agent on it, and unlock the last scene. Empty red chair, some flowers and scissors. I am struggling a bit with the "found word in the book" as you say: arrie NL 1/26/19, 1:23 PM. How do I find this found word? Why can't I get the corner clue to work in scene 4?? go into the cave, the … what shall we call him … wants a fish. sɹıɐʇs ǝpısǝq = a net. halfway up the stairs is the last plant. down arrow shows yet another box. (in scene4 now more flowers to take, I thought I had to fish there). ((I admit .. I used the net on the fish in the aquarium)). well, the only place that looks promising for a good catch is scene4. A hint please on where to go fishing? The book is TRICKy. The D is the K in book. bluepeahen did you get all 4 flowers? If yes go at the start scene - in the hall and to the right. Then put the plowers in the bottles. You can catch a fish in scene 4 in the water in front of the elf. Scene1. Did you see the word CLOUD? They are NOT letters, but shapes. Now look at the letters inside the book. They are placed in a grid. The C of CLOUDS surrounds the letter T. Do you recognize that? Scene4. The corners are formed by two lines. The first corner is down left. The second up right. Can you find the others? ahaaa ... there is a string !? I only have a stick and the net. Okay ... searching, thank you blue pea hen. Thanks arrie..I'm seeing DL, UR, DL, DR, UL, LR and UL, but it's not working. Got it! Thanks so much! I didn't see the little break lines. Too many of you got out already! You all cut too many pieces and cut them way too long. LOL! All that just to let the cat out! Sounds about right ;) Great game! ladycmd, the clue is not this. Go outside and look to the right of the big tree. There is a clue on the groung. 5 letter word, the last letter is K.
Antonia, what scene are you referring to? And could someone please tell me where to use the scissors to cut the string to attach the net to the stick? Thanks. arrie NL, the strung is in scene 4 Inside the room. facing red door to the up right. Put the chair/table below to reach it. I couldn't find it either. But up here they explained that it is on the cover of the book. The letter K is surrounded by the D.
@arrie - so many people are getting out because of your wonderful and very helpful "write as you play" walkthrough!! I was already afraid of that Antonia. It was the only plausible place, after taking the spoon. It's not there. I'm not going to replay. I got the string by digging in the ground in front of the cave with the spade. Are you sure about that string? Because of writing-while-playing I have two games open, and neither gives a string there. aaaahhh, Zoe, thank you, I'll try. I think I fried my brain..very stuck on squares with colors and code. Sorry, It is very late here, and I'm sleepy. Then try again in scene 3, slide puzlle, (did you find the picture? ), or to dig in front of the cave. Zoom onto the entrance of the cave and then dig to the left of the entrance. ladycmd - imo, that was one of the "harder" puzzles to figure out...I had to draw the pictures on a piece of paper...draw the 2 red pieces...try one on top of the other...or vice versa. The first number (red) is a 3. Thanks, Zoe, I'll try that. ladycmd, look at the color squares and see the shape of the bars which surround the color (color shape inside the squares doesn't matter). Now put bars above each other, according to the same color, and you will see the numbers. Inside the cave, a box with R and T.
Down left corner shows an A, down right a Z, meaning the letter in between R and T = S.
Click buttons to make that letter (start up right). Be sure to hear the sound, otherwise it won't work. Look at the rim of the picture, it gives the hint for the levers on the box in front of the “what shall we call him” = spade. Dig on the X as the pic shows = STRINGS Yes! About item net/stick, attach string, go fishing in scene4, in front of the elf. Give fish to “what shall we call him” = key, unlock box at the stairs = last plant. I'm stuck in scene 4 the third scene--with Wasabi). I have unlocked the plant growth thing, and Arrie says there's a glass I can put it in, but I don't have a glass. What do I put it in? ladycmd, the 4 digit number is a clue for the password. It comes from the letters of the flowers' names. Full explanation is in Nafanya's comment at 12:38. Or if you want it to be faster it is color (red+white)- 4 letters. oh, not out yet, a whole new scene. that 7 is the example. On the left, the colourgrid. Bring the two yellow squares together, on top of each other, and you can draw a 7 where yellow is touching the sides of the squares. So, put the top red square on top of the bottom one and draw the lines where red touches the sides of the squares. The numbers are written in the digital way. I warned you, I really did! In scene 1, you were in a hurry to get to the next scene, but ..... above the 'unlock' up right, is a glass. Thank you Arrie, and everyone! The roman numerals refer to the scenes. I couldn't help reading all the above already. But still, I had to think. scene I : 4 leafs are left. The 4th number on the paper is an 8 = take 8th letter from the name of the plant in scene1. scene II : 1 leaf. 1st number on the paper is 8 = 8th letter from the name of the plant in scene2. scene III : 3 leafs, 3rd number = 3, 3rd letter from name in 3.
scene IV : 2 leafs, 2nd number = 6, 6th letter from name in 4. And to end it all, it's about shapes again. Cut the W in half = V.
So cut every symbol in half and you get 'R'ight and 'L'eft, to click the door open. We are thanked for playing this game; thank you Rinogogo for creating it :). A pleasant and unexpected end of the day. Great game! :D Loved it and hope for more like it. Big thank you to the creator(s)! Thank you to arrie NL helping me with the missing letter, that was a tricky pussle. There were a lot of things I liked about this game, and some things I didn't. I also liked many of the puzzles. The colourd shapes in the 4*4 grid, for example, is one of the best puzzles I've ever seen. Sadly, there were some puzzles I know for a fact I wouldn't have solved on my own in a million years - the "notorious" 4-letter password where you had to combine 3 hints, was such an example. The problem IMHO was that interpreting the hints were somewhat arbitrary - and they shouldn't be. That puzzle, to me, was just too random to solve. All in all a very good one. It drives me nuts when some navigation arrows are hidden until moused over. Either do it one way or the other! Thank you arrie for most of the clues, and Zoe for pointing to the up/down clue on the edges of the snapshot. And after I deleted the snapshots of all the plant names I needed them for the final (very obscurely clued) password SPpOIiLnEkR. Great game. the game doesn't load on my laptop.